A cloudy, dreary day in NYC calls for a movie. We were up early so we strolled over to visit the feisty Greek lady at our local food truck for an egg on a roll, grabbed a Starbucks and took in a morning movie at 10:10am. 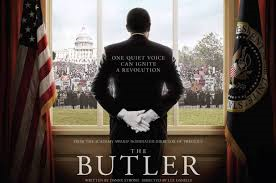 We bought in to the hype around, “The Butler”…that was our pick and it did not disappoint. Clearly, many others chose, “The Butler” because the weekend box office totaled $25 million. “The Butler” was inspired by an article by Wil Haygood in The Washington Post about the life of Eugene Allen who worked as a butler in the White House during eight presidential administrations. The film succeeded in connecting and contrasting the civil rights movement with an intimate look inside a family’s private experiences.The horror and the heroism of the race battle in America are openly portrayed in the movie, We get it really wrong, but we valiantly try to make it right. Forest Whitaker gracefully walks the line between dignity and being the best he can be at his job at the White House. He adhered to the threatening advise he received as a house boy on a cotton plantation and turned out to be his lifelong mantra, “The room should feel empty when you’re in it.” He became adept at disappearing in plain sight. Whitaker, in the fictional role of Cecil Gaines, will definitely be nominated for an Oscar for his compelling and emotionally evocative performance. The story is also a chronicle of generational misunderstandings. Parents sacrifice everything for their children and they turn around and misconstrue the parental intentions. 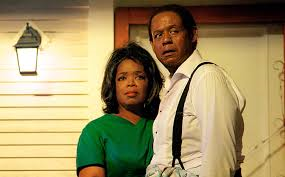 Oprah Winfrey blew me away with her restrained performance as Gloria, the butler’s wife. The Presidents were deftly played by Robin WIlliams as Eisenhower, James Marsden as JFK, a disguised Liev Schreiber at LBJ, a sweaty John Cusack as Richard Nixon and a rouged cheek Alan Rickman as Reagan. It is not an easy movie to see, but you must! You feel shame, disappointment, sadness and eventually joy and hope during the 2 hour course of this thought provoking film. “The Butler” will wait on your emotions, hand and foot. We followed up the movie with brunch yesterday at a terrific restaurant that I will review soon. The food and the atmosphere are French and Fabulous. The tables are extremely close and this can be good and bad. When we first squeezed into our end table that abutted a brick wall, we were intimate with a party of 6. A quite verbal, loud mouthed middle-aged man, his mousy wife, son and 3 other 20-somethings comprised the party. I had to check with David to see if we were viewing a re-enactment of the Paul Rudd/Saturday Night Live skit where Rudd brings home his girlfriend and introduces her to his parents and brother. They all enthusiastically French kiss and feel each other up upon arrival. On TV it is hilarious. In a contained restaurant setting with strangers, it is sweat inducing. The younger generation were quite physical with each other, but outdone by mother and son.The mom continually massaged and rubbed her son’s arm and leg and then kissed him passionately on the mouth. Well, at first I thought I had made a huge mistake and it was cougar and cub, but the loud mouthed man was clearly her husband and when they finally departed, the cub called the cougar, mom…seriously? I did mention that the tables were incredibly close! After throwing up a little bit in our mouths from the inappropriate display of familial affection, we had a drink and proceeded to completely enjoy a sumptuous brunch.